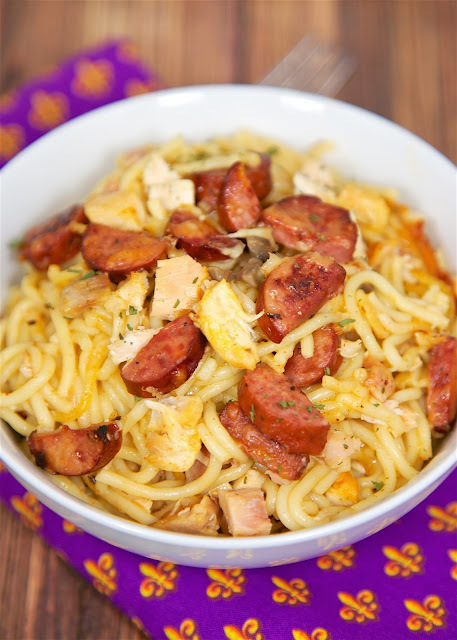 Cajun Chicken Tetrazzini - andouille or smoked sausage, chicken, pasta, cajun seasoning, cream of chicken, cream of mushroom, chicken broth and parmesan cheese. SO good! We ate this 2 days in a row. Can make ahead and refrigerate or freeze for later. We could not get enough of this casserole! Chicken Tetrazzini is one of my all-time favorite foods. I can eat insane amounts of it in a ridiculously short amount of time. It embarrasses Chicken Legs how much I can Chicken Tetrazzini eat! LOL! I can't help myself, I love it. 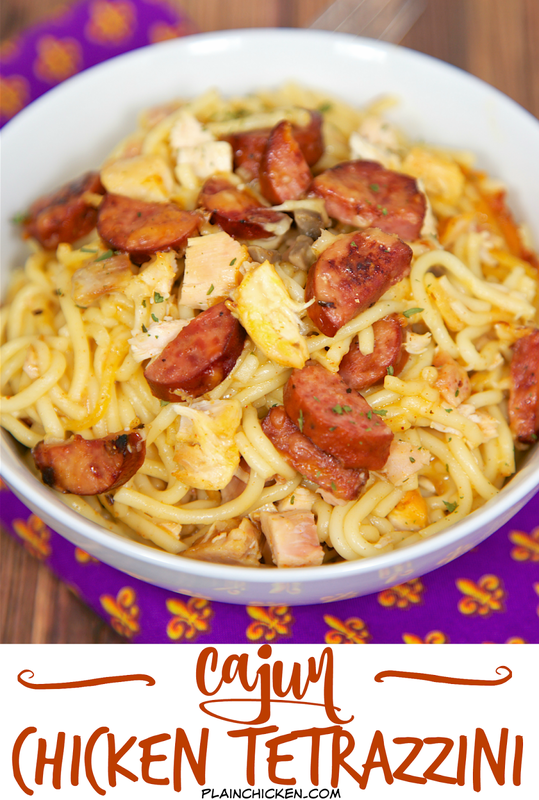 I came up with this cajun twist to my Grandmother's original recipe, and it was a huge hit at our house. We both loved it. We ate it for dinner and lunch the next few days. SOOO good! I loved the cajun seasoning and andouille sausage with the chicken. Seriously delicious! I am already planning on making this again next week! 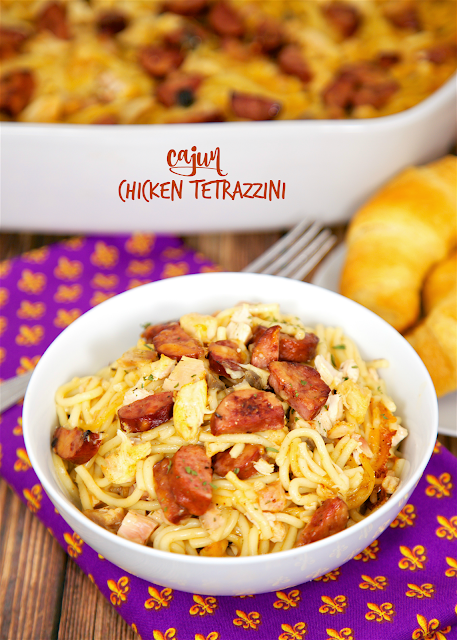 This Cajun Chicken Tetrazzini is super easy to make. I used a rotisserie chicken, and it literally took about 10 minutes to assemble. I chopped the chicken and pan seared the sausage while the pasta cooked. So easy! You can make it ahead of time and refrigerate it until you are ready to bake. I've never frozen the casserole, but I think it would be fine. Preheat oven to 350. Lightly spray a 9x13-inch pan with cooking spray. In a large skillet over medium heat, cook sausage until lightly browned, about 5 minutes. Remove from heat and set aside. Whisk together soups, chicken broth, and cajun seasoning. Lightly spray a 9x13-inch pan with cooking spray. Layer 1/2 vermicelli, 1/2 chicken, 1/2 sausage, and 1/2 of soup mixture. Sprinkle half of the parmesan cheese on the pasta. Repeat layers and top with remaining parmesan cheese. Bake uncovered for 45 minutes, until bubbly.